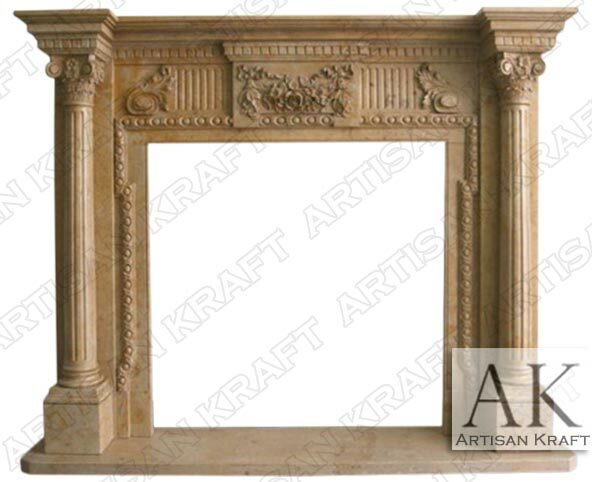 This is a classic fireplace mantel surround that was carved from marble. It has beautiful carvings throughout the columns and the mantel shelf frieze. Fluted marble columns are a either side of the firebox opening. They hold up a mantel shelf that has beautiful inlay with dental molding. The fluted columns sit on a square pedestal and have a decorative cap. This Italian style fireplace surround is currently available at a great price. Give us a call to find out more details about it.